In May I purchased my first street bike. I took the motorcycle safety course, got my license and then went in search of the perfect bike for me. I had my list of specifics that I wanted. I wanted something sporty but didn’t want to constantly be leaning over. I wanted something with a big enough engine to keep up with my hubby’s Yamaha FZ1 but wouldn’t be overly intimidating to a first time rider. I’m also a little on the short side (5’3”) and wanted something small enough and maneuverable enough for me to handle with confidence. 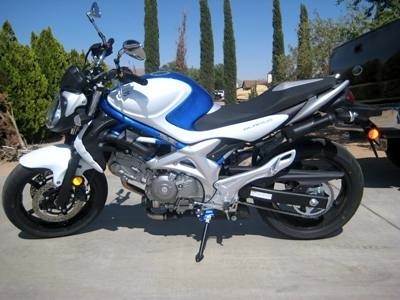 After checking out numerous bikes, comparing a variety of specs and asking countless questions, I finally found my bike- a white and blue 2009 Suzuki Gladius. I love my little Gladius. It rides smooth, it's light and maneuverable and it’s so much fun! And at 650cc, it has plenty of power! My hubby and I have been going on short trips around town, and we’re both looking forward to longer trips together in the future. I’m 44 and at first I worried that I was too old to take up motorcycling, but I’m finding out what more and more women my age (and older) have discovered- that you’re never too old to learn something new and to have fun doing it. And as the saying goes, “4 Wheels move the body, but 2 Wheels move the soul”. Happy motoring ladies and ENJOY the ride! About the only negative comment I've heard concerning the Gladius is the seat. I just got my Gladius back from Corbin Custom Seats located in Hollister, CA. My new seat feels and looks WONDERFUL!!!! I just bought my first bike also, which is exactly the same as yours, a Suzuki Gladius. I love it because it doesn't feel heavy, and is has just the right amount of power. Happy riding! Hi I'm really happy that you went out and did this wonderful thing for yourself. I love that saying, never heard it before. Happy trails to you girl.